Pull out your royal wedding betting books and get ready to update your odds, because Meghan Markle is on the cover of this month’s Vanity Fair. Which admittedly makes her sound like very good company. 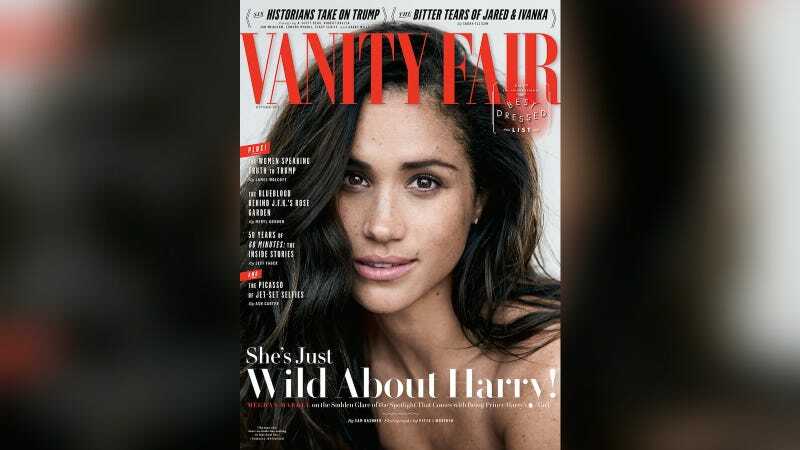 Just the fact that Markle is on the cover of Vanity Fair—in September, no less—says something about the likelihood she and Harry will make their way up the aisle together. But they got Sally Bedell Smith, who’s written biographies of both Queen Elizabeth and Prince Charles, to weigh in on the odds; “The Queen is remarkably open-minded and she’s very tolerant,” Smith said of “the prospect of a marriage between her grandson and the American divorcée.” Well, and the last time they picked a blushing, sheltered ingenue it was a goddamn disaster. Of course, what’s the cover line?